Sensuality and sense in general have a strong connection with our moods.If we smell something bad, we may feel nauseous, if we hear some slow music, we may feel relaxed.There are scientific studies that prove how colours affect the state of mind of the human being - red stimulates and makes us anxious, and blue promotes calm. 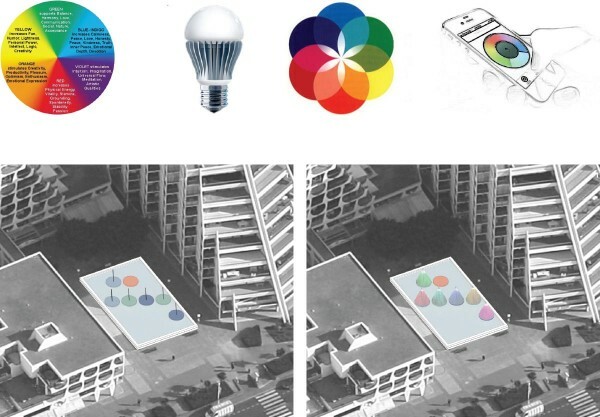 Our proposition is a light installation , that refl ects the priniciples of colour therapy. In general the cities we live in,are built of similar materials with similar colour palette, The same goes for the public lightning. The circle plates in the fountain on Place Marc Janicaud are used as base for a lightning installation.Every circle is a base of a textile conus shaped tent.On the top of the structure a lightning bulb is fi xed, so that the whole tent is illuminated and visible even during the day. The colour of the light can be changed through a simple smart phone application.An info stand with information about the colour therapy is going to be constructed, so that every visitor can experience the effect of the colour therapy for himself. Some of the tents have an opening and a seating possibility, so they can be explored from the inside, with an even stronger perceptipon of the light effects.